I have been dealing with Laney's for many years. My wife loves it every time she sees a box from there for Christmas, birthdays and anniversary. They know me by name when I walk into the store which is very nice. I have called and told them what is was looking and and Rebecca said she would take care of it and would call me when it came in. If Rebecca sees something she thanks my wife would like she will but a note in the file and let me know the next time I am in. They have designed and made some pieces for me that were great. Unlike chain stores, whose employees simply sell to make the most money possible, the wonderful staff at Laney's learn the personalities and tastes of their customers and help them select the most appropriate items, regardless of the price. My family members are greeted by name when we arrive, and every piece we have purchased can be recalled by the excellent staff, without having to look up our account history. 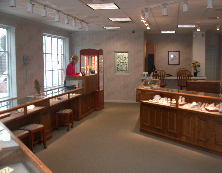 The personalized service, along with their obvious knowledge and skill, has made them our only store for jewelry purchases and repair. Everyone was so nice and very helpful and above all honest. I some pieces of jewelry my mom had left me and I wanted to taken then apart and make new pieces for me and my daughters. They made me two rings and a necklace, and they are just beautiful and we all love the new jewelry. Then I had them appraise several pieces of jewelry for me---boy was I surprised at how much they were worth. The gave me a very professional document with pictures and amounts for my insurance company. I now have the pieces of jewelry cleaned and checked every six months for loose prongs etc---at no charge. I've taken several items to Laney's for refurbishing or repair. Every time I've found them friendly and knowledgeable. They've given me options, told me what to expect right up front, given advice when I've asked, and have always had the work finished on time. I've been completely pleased with each visit and each transaction. Laney's worked with me to design a perfect engagement ring while always keeping my budget in mind. I loved it so much that my now wife and I got our wedding bands there as well. We love all of the rings and could not be happier wih our decision to trust Laney's. My relationship with Laney's goes back many years prior to Laney actually opening a store. She worked out of a small office on a one on one basis. You have established a courteous and professional business and staff and I appreciate the personal service you give each customer. I have always felt welcome and I have the upmost respect and confidence that my needs will be met. Thank you !! I have always enjoyed my experiences at Laney's from the time Bob and I picked out my wedding ring 26 years ago until early this month when I went to pick up some re- vamped earrings. Thanks for being there for me. You make wonderful things happen and your creative ideas always work.